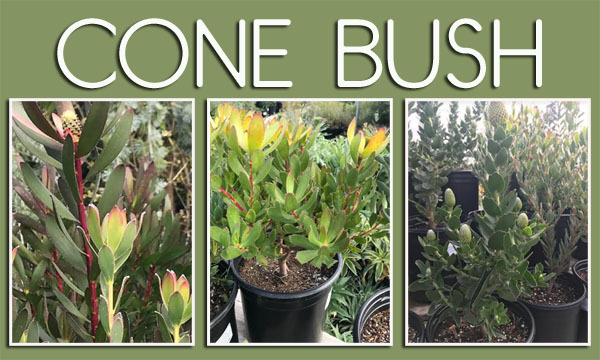 If you are a gardener who desires a plant that is low maintenance, avoided by deer, and drought tolerant then Leucadendron might be the plant for you. Leucadendron is the botanical name for the Cone Bush. The plant’s Greek name (Leucadendron) is actually something of misnomer. “Leukos” means white and “dendron” means tree, but while white ones can be found, the plants are most popular for their vivid and vibrant colors of orange, pink, yellow, or red depending on the cultivar. The seed heads or infructescences, are woody cone-like structures, which gave rise to their common name – Cone Bush. The cones contain numerous seeds and about half of the species store the seeds in fireproof cones and release them only after a fire has killed the plant or at least the branch bearing the cone. Cone Bushes are grown for their cone-like inflorescence which form at branch tips and make stellar, long- lasting cut flowers. They even survive in a vase long after the water has dried up. The flower itself is relatively small, while the brightly colored “petals” are actually bracts or modified leaves. These inflorescences can sometimes reach 12 inches in diameter. These Mediterranean style, coastal gems produce exotic waxy spider-like flowers from late winter into spring.There are many selections and types that can be used in the landscape or as cut flowers. Most of these 4 to 8 foot tall and wide water-wise beauties look spectacular in the garden adding a dash of winter color. In the garden they can be combined with plants like Grevillea, Australian Fuchsia, Agave, Crodyline, Kangaroo Paw, Tea Tree, Grasses, New Zealand Flax, cactus, large boulders, and other succulents such as Sticks On Fire in a sheltered seaside garden. wispy habits. Many Cone Bushes have the unique chameleon-like ability to change their leaf color from green to burgundy or blush tones, to shades of yellow throughout the seasons that makes them an outstanding garden subject. When placing them in the landscape be mindful not to crowd them. They absolutely love good air airflow in and around themselves. Don’t allow the shrub to touch other plants because they may get foliar diseases. To thrive at their fullest potential, these South African native plants require exceptionally fast, well-draining sandy or gritty soil that is acidic. (A good planting mix to use for this species is Acid Planting Mix and Soil Sulfur fertilizer, mix them into the soil uniformly.) In a clay soil it is highly recommended to place them in a suitable container or in a raised bed where soil would have adequate drainage. Cone Bushes despise wet feet and soggy soil, causing them near instant death. To help avoid this, plant them on a slope or mound. When watering, do so deeply and slowly in the absence of rain by allowing a hose to trickle. As a general rule, one watering per week is sufficient depending on conditions. Allow the soil to dry between waterings and never water if the soil is still wet from the previous irrigation. After the first one to two years, they require water only during extended dry times. It is wise to not allow water to touch the leaves as this can encourage fungus development if the foliage is wet for an extended period of time. Instead, water the plant at the base. If overhead watering is the only option, irrigate earlier in the day so foliage can dry before nightfall. It is also suggested to spread a layer of mulch around the shrub to conserve moisture, keep the roots cool, prevent weed growth, and be sure the mulch is not touching the trunk. Also, when planting, try not to disturb the roots too much as they are delicate. Cone Bushes prefer to be living in an area that is above freezing. They require lots of sun, are tolerant to ocean winds but not dry winds . Generally speaking, this species is not a heavy feeder and doesn’t require fertilizing. If you do fertilize, use a plant food that is low in nitrogen and phosphorus (the first two numbers on a fertilizer package) and higher in potassium (the third number on a fertilizer package). Fertilize your Cone Bush only if growth appears stunted, as the plant doesn’t respond well to heavy fertilization. You may also need to supplement with soil sulfur fertilizer to maintain the acidity of the soil. When pruning, the goal is to encourage the showy new growth by pruning selectively the long and leggy shoots halfway down during and after flowering. Prune the branches above at least four leaves and never prune leafless branches. Clip off wilted flowers to keep the plant tidy and encourage the development of new blossoms. We offer a variety of these special plants as well as other great plants at your favorite Green Thumb Nursery to use in the landscape. It is advised to call ahead to check on specific availability.